We don’t live in Berkeley, CA but we live close enough to be influenced by the New Age movement that thrives in that town. The following questions shouldn’t then seem bizarre to you: Can dogs become New Age? Can New Age psychology help dogs become better dogs? It seems possible. 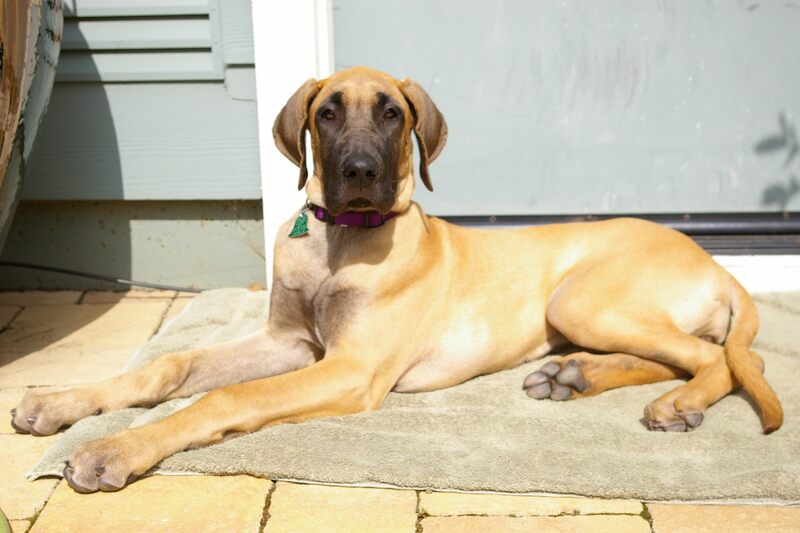 To my wife (MW), it must seem almost probable–even bordering on likely–because she’s gone a little New Age with Luna, our great dane puppy. One of the common beliefs among New Agers, at least the New Agers I’ve met or whose organic beer I’ve consumed, is that thoughts become reality. If you think something hard enough, and say it aloud often enough, you’ll inch closer to whatever you want. We’re not New Agers but MW seems to believe that this repetition stuff leads to belief, and belief leads to better puppy behavior. Seven weeks ago, she started using affirmations with Luna. She started alternating “you’re a good dog” with “you’re such a good dog.” She replaced both with “you’re a really good dog.” She also upped the frequency to 8-10 times a day. She next added affirmations that probably aren’t going to have a lot of effect on her present and future behavior, such as “you’ve got such soft ears.” Other phrases (affirmative statements of fact??) have included “you sit so nicely” and “you’re a really good eater,” the same praise you so often hear from parents with infants. Not the sitting part, rather, the facility with eating. The best dog? In the whole world? About this”best thing”….there is a ton of evidence from the world of professional athletes that excessive childhood praise produces adult jerks. Excessive praise probably played a not inconsequential role in the douchebag behavior of feted sporting heroes like Alex Rodriguez, Kobe Bryant, and Cristiano Ronaldo. Would you want any of them as a son-in-law? Would you want your adult dog behaving like they do? The world is a pretty big place, too. Unless you live, as we do, near the Northern California coast where the prevailing winds can import radiation from the crippled Fukushima nuclear reactor in a couple of days. And the world’s canine population is pretty big, too, so there’s probably credible competition for a “Best Dog in the World” crown. Has all of this repetitive affirmation worked? We’re not sure. Fortunately, or unfortunately, depending on your view, we don’t have a control group. That would mean two great dane puppies – double the cost, double the poop, double the pre-sleep craziness and so on. One is enough, thank you. You’re the top, you’re the Louvre Museum. You’re a Bendel bonnet, a Shakespeare’s sonnet, you’re Mickey Mouse. But if, Luna, we’re the bottom, you’re the top!